Yesterday afternoon, out of the blue, I got the itch to run. Which was awesome, because while I was training for Augusta, I rarely experienced that on account of the fact that I had such a strict workout schedule set that by the time the urge to run would hit, I was already heading out for whatever workout I’d planned for that day. The weather was sunny and in the mid-80s with, for Florida, mild humidity. I was about to wrap up with work and Jared was game to join me. The only question was, where should we go? I was really feeling a trail run, and nearby, we have a couple of options: the San Felasco trails (which I’ve written about before) are amazing — I know them and love them and run them frequently. However, you need $3 cash to park there (which I didn’t have on hand), and we have another set of trails even closer to home that offer free parking. Only problem — I don’t know the routes and I didn’t remember them being terribly well-marked. But, hey, isn’t that part of the allure of trail running? Getting a bit lost and finding your way out of the woods? In this case, the answer was a complete and total yes. We definitely had to stop a couple of times to note where the sun was and where the road noise came from in order to get our bearings, but 4.1 (it’s that .1 that really gets you, you know) miles after we took off, we found ourselves back at the car, sweaty, dirty and smiling like fools. We might not have been particularly fast, but we ran hard and nobody fell, so all in all, that counts as a big win. Now, while there’s certainly nothing wrong with going out and running without a plan or a goal, I was fresh off my Runner’s World Half weekend (so much more to come about that, just you wait!) 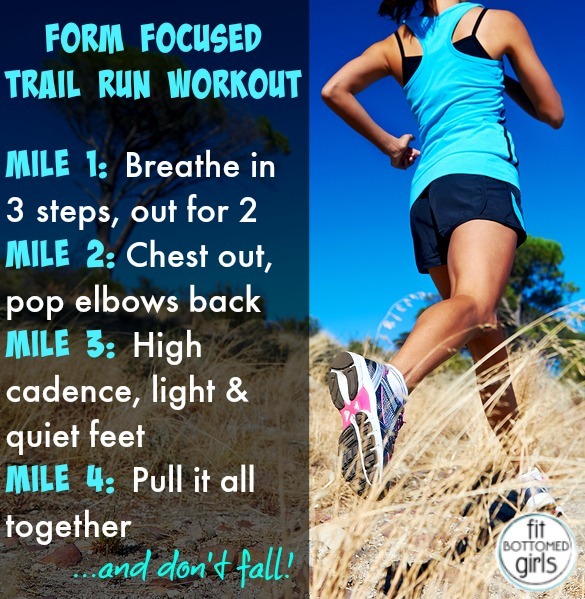 and feeling inspired to incorporate the tips I’d been given about running form and breathing while there. So, I didn’t focus much on where we were going or what pace we were holding, but here’s how I broke up the run in terms of focus.